Foot pain can be acute or sudden onset as in fractures or sprains, or may develop gradually over time (chronic foot pain). Select from the options below to view causes of foot pain for different parts of the foot. If you are not sure what is causing your foot pain then why not try our sports injury symptom checker? Pain on the outside of the foot. The most common causes of heel pain are Plantar fasciitis and Bruised heel (fat pad contusion). Plantar fasciitis develops gradually over time with symptoms of pain under the heel, which may radiate into the arch of the foot and is often worse first thing in the morning. A bruised heel, also known as Policeman’s heel also has gradual onset pain under the heel, similar to Plantar fasciitis, but is not normally worse in the mornings, nor does it radiate into the arch of the foot. The most common cause of pain at the back of the heel in children is Sever’s disease. View all causes of heel pain. The most common cause of pain in the arch of the foot which develops gradually is Plantar fasciitis, which is inflammation of the attachment of the plantar fascia (arch ligament) to the Calcaneus (heel bone). A plantar fascia strain is a tear to the arch ligament, which can occur suddenly or may develop over time through repetitive strain. View all causes of foot arch pain. The most common cause of gradual onset or chronic pain on the top of the foot is Extensor tendinopathy (Extensor tendinitis), which is inflammation or degeneration of the extensor tendons, which run along the top of the foot and lift the toes upwards. It is usually caused by overuse, or from wearing shoes which are too tight around the midfoot. Other causes of pain on top of the foot include stress fractures (especially Navicular stress fracture), and midtarsal joint sprain. Lisfranc’s injury is a dislocation or fracture in the midfoot area which is rare, but can cause serious long term complications if it goes undiagnosed. View all causes of pain on top of the foot. The most common cause of forefoot pain is a Bunion (Hallux valgus). A bunion is a painful swelling of the tissue with bony growths on the inside of the foot. Common causes of pain under the ball of the foot include Sesamoiditis, which is an inflammatory condition of the Sesamoid bones under the ball of the foot, and Morton’s neuroma causing pain between the third and fourth toes from a compressed nerve. Sudden onset forefoot pain could be from fractures of any of the bones in the forefoot. Turf toe is a sprain of the ligament under the base of the big toe and is caused by bending or forcing the big toe upwards too far. View all causes of forefoot pain. Common causes of pain on the outside of the foot include Peroneus Brevis tendon injury, which is a strain of the tendon where it inserts into the outside of the forefoot (the 5th metatarsal bone). A Midtarsal Joint Sprain causes pain in the outside of the midfoot. A Jones fracture is a fracture of the 5th metatarsal bone on the outside of the foot, caused by overuse or from an ankle sprain, and Cuboid Syndrome occurs gradually over time, when the peroneus longus muscle in the lower leg applies excess traction onto the cuboid bone, causing it to partially dislocate. View all causes of outside foot pain. A bunion (painful swelling over the inside of the big toe) is a common cause of pain on the inside of the foot. A Navicular Stress Fracture is a common overuse injury in athletes with symptoms of a vague ache in the midfoot, which may radiate along the inside arch of the foot. Tibialis posterior tendinopathy is another overuse injury, causing pain on the inside of the ankle and under the foot. View all causes of inside foot pain. Sudden onset toe pain is likely to be a fracture (broken toe) or a dislocation, either of which is likely to cause soft tissue damage and/or a black toenail (Subungual Hematoma) as well. Gradual onset toe pain can be from an Ingrown toenail, Hallux rigidus (stiff big toe), or Hammer toe which is a deformity of the smaller toes. Blisters, Corns & Calluses also commonly affect the toes of sportsmen and women. View all causes of toe pain. Midfoot pain refers to pain anywhere in the middle of the foot where the small tarsal bones are located. 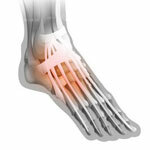 The most common cause of midfoot pain other than following a sprained ankle is a midtarsal joint sprain. A stress fracture of the navicular bone is also common and should not be missed. If there is a pain in the midfoot area for more than five days following injury, then a Lisfranc joint sprain should be considered. View all causes of midfoot pain. Skin problems on the foot are very common for those who do sports. When the feet regularly get warm and sweaty, the potential for skin conditions to develop increases. Athlete’s foot commonly causes itching between the toes, Corns & Calluses develop where there is pressure or thickening of the skin, and blisters occur anywhere on the foot but are most common between the toes and at the back of the heel. View all foot skin conditions. The PRICE principles (protection, rest, ice, compression, and elevation) are the gold standard set for treating acute foot and heel injuries. PRICE should be applied as early as possible and continued for at least the first 24-72 hours. Rest – in the early stages, rest is one of the most important components of the P.R.I.C.E principle but is often neglected or ignored. It does not only refer to the prolonged period of time that the athlete will be out of action but also to the immediate period after the injury. Cold therapy, also known as cryotherapy, is one of the most widely known and used treatments for acute sports injuries. It is cheap, easy to use and requires very little time to or expertise to prepare. A cold therapy and compression wrap is a convenient way to apply cold therapy. Ice should not be applied directly to the skin as it may cause ice burns. Compression is applied to minimize the amount of swelling that forms after an injury and should be applied for the first 24 to 72 hours from the onset of injury. The most effective method is by using a compression bandage which is an elasticated bandage that simply fits around the affected limb. Elevating the injured limb is the final PRICE principle but is equally as important as the other 4. Elevation uses gravity to drain the fluid away from the injured site, therefore swelling and pain. When should you see a doctor with your foot pain? If you have any of the following symptoms you should seek medical assistance. A changed sensation in the foot – such as a feeling of “pins and needles” (paresthesia) or a “loss of feeling” (anesthesia) in the foot. Inability to complete normal daily activities after the initial 72 hours. Further medical help can be sought through either your local GP or a private clinician such as a podiatrist, physiotherapist, sports therapist, osteopath, or chiropractor. If you have followed the P.R.I.C.E. principles (see above) and are still unable to walk after 72 hours, or still have severe pain that is not subsiding, you should visit your local A&E department. If you have applied the P.R.I.C.E. principles and still have a weakness that lasts a long time (more than 2 weeks), or has ongoing discomfort in your foot or heel, you are highly recommended to seek advice from a specialist expert. Experts include a podiatrist or physiotherapist, osteopath, or chiropractor – who can all give you advice and an appropriate recovery and rehabilitation program.